Finally the time is near. After months of waiting, reading up on your puppy raising skills, making the house puppy proof and trying to keep the kids calm from anticipation, the day has finally arrived that you are going to pick up the newest member of the family. As soon as you see it, your eyes light up and your heart makes a little jump: you are instantly in love with this little furball of a baby and you want to give it the best care in the world. The first night is exciting: will it sleep, or will it cry it's eyes out and keep the whole neighbourhood awake? The first weeks go by so fast, deviding your time between potty training, feeding, learning to walk on a leash, learning to be alone and increasing the pup's independance and feelings of self worth, socializing with other dogs, people, strange sounds, vehicles and basically introducing your pup to the world, puppy training, playing, teaching rules, boundaries and limits. And before you know it, you need to adress the needed coat care, because the coat keeps on growing and although at first tangles seem to be decades away, suddenly it gets harder to brush the coat and the first tangles appear. Then the queston arises: do you find a suitable groomer, or do you keep grooming your Doodle yourself? A lot of owners go out to find a suitable groomer, and a lot of you are disappointed after that first time. Either your lovely pup is clipped shorter then you would have liked, or groomed like a Poodle and maybe even your pup is stressed out by that first grooming experience. Which is a shame, because to keep the coat healthy and tangle free, it needs to be groomed every 8 weeks and maintained well in the meantime. Sooner or later you find out that while you have bought the cutest, fluffiest pup ever, you have also bought a dog with the most high maintenance coat in the world. And it's not just the coat, it's the clipping of the feet, the plucking of the ears and other important basic maintenance tasks that insure your Doodle's health. But don't freak out, because this gives you the chance to be the best Doodle parent ever, because why not learn to groom your Doodle yourself? I will give you 8 reasons why grooming your Doodle yourself is the best thing for you and your Doodle. 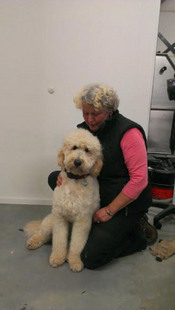 Doodles are very sensitive dogs and what's right for other breeds can be too stressful for a Doodle, like spending its time around a lot of loud other dogs, in a crowded environment, with lots of scary noises of grooming equipment and groomers that are stressed and on a deadline to get the dogs groomed in time. A lot of Doodles are traumatized by their first grooming experience, because it's too much for them to handle, or the groomer is too impatient, harsh or uses the wrong grooming equipment. If you learn to groom your Doodle yourself, you can do it which ever way suits you and make sure it gets the best care. A lot of Doodles are clipped short, either because of tangles, because it's practical or because the groomer doesn't know how to groom by hand, in a natural looking, fluffy way. A lot of groomers don't because they are used to clip and scissor cut Poodles and Doodles are new to them. By learning how to groom your Doodle professionally yourself, you can find out which coat length looks fluffy and natural, but is still practical to maintain. Why should you choose to spend 4 hours grooming your Doodle, if you can decide to groom it in shifts of for example 3 days: you can groom the body on day 1, the legs on day 2 and the head on day 3. No stress, no hassle, just the way it feels right for you and for your Doodle. How long does it take you to find a suitable groomer, make an appointment and drive your Doodle to and from the groomer, waiting to hear when it's ready? How would you like to be able to spend that time on something else? 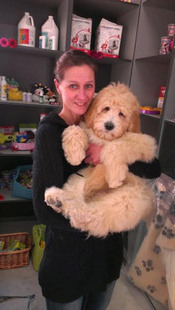 How much does it cost you to have your Doodle groomed every 8 weeks, for 15 years? And if you have multiple Doodles: how much does it cost you then? And how satisfied are you after spending that money? Wouldn't you rather do a one time investment in the right professional grooming equipment and take the wellbeing of your Doodle in to your own hands, saving lots of money on grooming costs and gasoline? When you start doing the basic maintenance of your Doodle yourself, you will know exactly what it’s health condition is like and know when it's time to consult a veterinarian. Your Doodle's ears need to be plucked every 6 to 8 weeks to prevent ear infections. Why depend on a groomer for that if you can do it yourself? 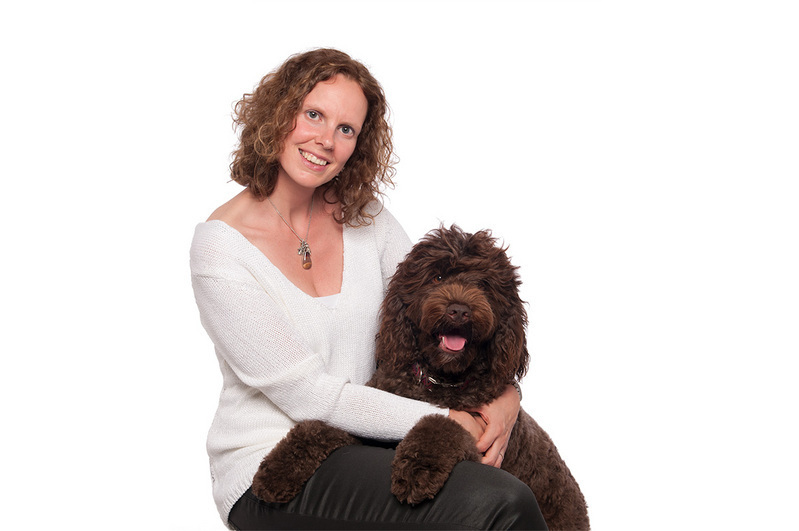 But also by knowing what an unhealthy coat looks like, or screening your Doodle's reactions (to pain) while grooming it, you can monitor your Doodle's health by grooming it yourself. Nowhere does your Doodle show it's true colours more then on the grooming table. Grooming means a restriction in your Doodle's freedom, so if it doesn't want to be groomed, it will let you know. This is your chance to become a true leader to your Doodle and form a true partnership with it, based on mutual trust and confidence. Don't let a groomer be the one to raise your Doodle, step up as a true leader to your Doodle yourself and you will enjoy lifelong benefits from it. How often do you need to share your Doodle with others? With the children, your partner, other family members, dog friends etc? Grooming your Doodle yourself is your chance to get exclusive 1 on 1 bonding time with it. If you take the time to work in peace, grooming can be a soothing, healing, calming wellness experience for the both of you, strengthening the bond while you learn to really feel your Doodle and anticipate to its needs. It can be so calming, that it's like meditating with your Doodle. Very enjoyable! If this doesn't make you eager to start learning how to groom your Doodle yourself, I don't know what does. I have been giving professional Doodle grooming workshops for 3 years now, and I haven't met a single owner that thought "I can do this, without a doubt". Most of them doubt their abilities, are affraid of hurting their Doodle and think that grooming is an art that they can’t possibly tackle. So I can truely understand your second thoughts after reading this. I am here to tell you that all those people left the workshop being totally proud of themselves and their Doodle and of what they had accomplished, feeling more self-confident then ever and eager to start grooming their Doodle at home. You just need the right teacher, the right equipment and the right knowledge and insights. 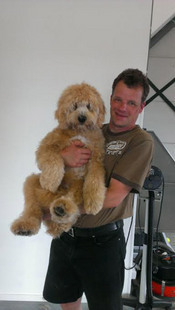 My Professional Doodle Home grooming programs are designed especially for that. If you aren't yet, you can start with downloading the FREE preview of my upcoming book "From Scruffy to Lovely. How to keep your Doodle healthy, happy and tangle free? The first ultimate guide to Doodle coat care and comfort" on this site. A journey to a strong Doodle/owner relationship and confidence in grooming your Doodle yourself, in a natural looking, fluffy way. I am here to help you all the way.